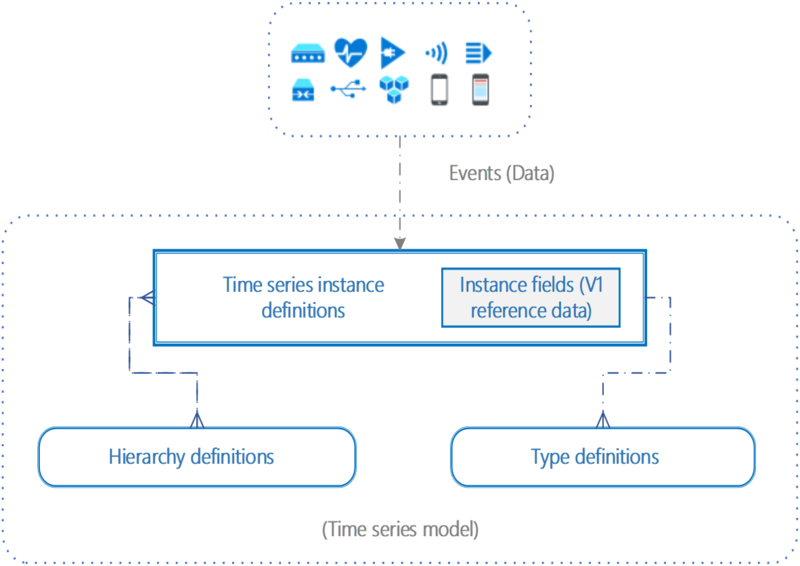 This article describes the Time Series Model part of Azure Time Series Insights Preview. It discusses the model itself, its capabilities, and how to get started building and updating your own model. Traditionally, the data that's collected from IoT devices lacks contextual information, which makes it difficult to find and analyze sensors quickly. The main motivation for Time Series Model is to simplify finding and analyzing IoT data. It achieves this objective by enabling the curation, maintenance, and enrichment of time series data to help prepare consumer-ready datasets. Time Series Models play a vital role in queries and navigation because they contextualize device and non-device entities. Data that's persisted in Time Series Model powers time-series query computations by taking advantage of the formulas stored in them. Author and manage computations or formulas, transform data leveraging scalar functions, aggregate operations, and so on. Define parent-child relationships to enable navigation and reference and provide context to time series telemetry. Define properties that are associated with the instances part of instance fields and use them to create hierarchies. Time Series Model types help you define variables or formulas for doing computations. The types are associated with a specific Time Series Insights instance. A type can have one or more variables. For example, a Time Series Insights instance might be of type Temperature Sensor, which consists of the variables avg temperature, min temperature, and max temperature. We create a default type when the data starts flowing into Time Series Insights. The default type can be retrieved and updated from model settings. Default types have a variable that counts the number of events. For more information about Time Series Model types, see the Reference documentation. Time Series Insights types have variables, which are named calculations over values from the events. Time Series Insights variable definitions contain formula and computation rules. Variable definitions include kind, value, filter, reduction, and boundaries. Variables are stored in the type definition in Time Series Model and can be provided inline via Query APIs to override the stored definition. Variable filters specify an optional filter clause to restrict the number of rows being considered for computation based on conditions. Variable values are and should be used in computation. This is the column in the events that we should refer to. The aggregate function of the variable enables part of computation. Time Series Insights supports regular aggregates (namely, min, max, avg, sum, and count). Hierarchies organize instances by specifying property names and their relationships. You might have a single hierarchy or multiple hierarchies. They don't need to be a current part of your data, but each instance should map to a hierarchy. A Time Series Model instance can map to a single hierarchy or multiple hierarchies. Hierarchies are defined by Hierarchy ID, name, and source. Hierarchies have a path, which is a top-down parent-child order of the hierarchy that users want to create. The parent-child properties map instance fields. For more information about Time Series Model hierarchies, see the Reference documentation. In the preceding example, ID1 and ID4 shows as part of hierarchy H1 in the Azure Time Series Insights explorer, and the rest are classified under Unparented Instances because they don't conform to the specified data hierarchy. Instances are the time series themselves. In most cases, the deviceId or assetId is the unique identifier of the asset in the environment. Instances have descriptive information associated with them called instance properties. At a minimum, instance properties include hierarchy information. They can also include useful, descriptive data like the manufacturer, operator, or the last service date. Instances are defined by typeId, timeSeriesId, name, description, hierarchyIds, and instanceFields. Each instance maps to only one type, and one or more hierarchies. Instances inherit all properties from hierarchies, and additional instanceFields can be added for further instance property definition. instanceFields are properties of an instance and any static data that defines an instance. They define values of hierarchy or non-hierarchy properties while also supporting indexing to perform search operations. The name property is optional and case sensitive. If name is not available, it will default to the Time Series ID. If a name is provided, the Time Series ID will still be available in the Well (the grid below the charts in the explorer). For more information about Time Series Model instances, see the Reference documentation. For more information about Time Series Model settings, see the Reference documentation. See Azure Time Series Insights Preview storage and ingress. See the new Time Series Model.